Zombie Tsunami is an adrenaline-pumping runner game created by Mobigame for both Android and iOS platforms. Released in 2012, this single-player, side-scrolling game has gained immense popularity among millions of players. To celebrate 100 million downloads in 2016, Mobigame rolled out a large content update that included a slew of new pets, bonuses, backgrounds, skills, and missions. Basically, you start the game with one zombie that runs through the streets nonstop. Your zombie can transform living humans into zombies, allowing you to gather a horde of hungry, energetic, incoherently mumbling zombies. With four zombies, you can overturn one small car. By increasing your zombie procession, you can overturn buses, airplanes, and tanks and gobble up the humans inside those vehicles. As long as you have one zombie left, the game continues on and on, and the background changes periodically. Along the way, you also can devour bonuses and power-ups to turn your zombies into skilled, sword-wielding ninjas; a giant zombie that shoots lasers; a sturdy, flying dragon; floating, large-headed zombies; or a group of bulky football players who crush things that get on their way. 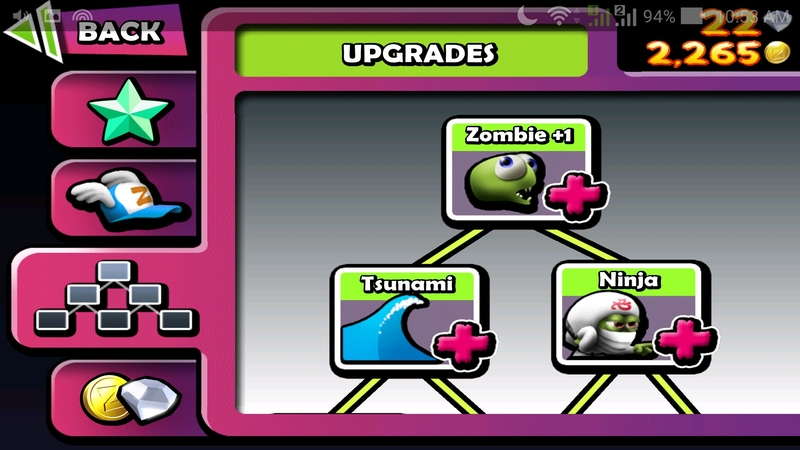 My favorite power-up so far is the tsunami, which easily destroys everything on its path without losing any zombies. Other power-ups, especially the football players or UFO clones, tend to fall down the holes, whereas the tsunami lets you wolf down more zombies as well as earn all available gold coins along the way. Even though your horde of zombies keeps on growing, you can easily lose half of them when you jump over a large hole, encounter bombs, or hit a moving car or helicopter. This is probably the most annoying part of the game, because at one point you’ll have more than 20 zombies, but then the next second you’ll have only 10 left. Nonetheless, I do think losing zombies quickly and haphazardly makes the game more fun and challenging. You’ll just have to do your best to jump adeptly over the holes and bombs, and avoid all moving cars. Also, you’ll have to be able to predict if shaking grounds are going to crumble beneath your zombies feet, so you’ll know whether its time to jump. If you jump too early or too late, your zombies can rapidly fall to a hole and die. 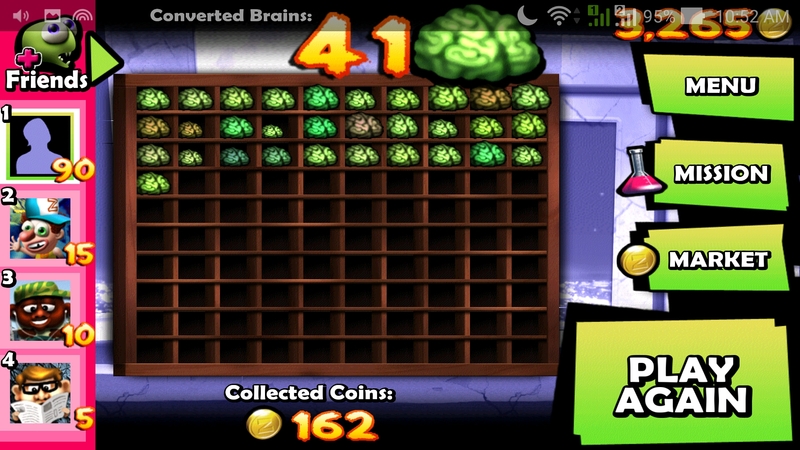 Zombie Tsunami is completely playable without the need to shell out money. 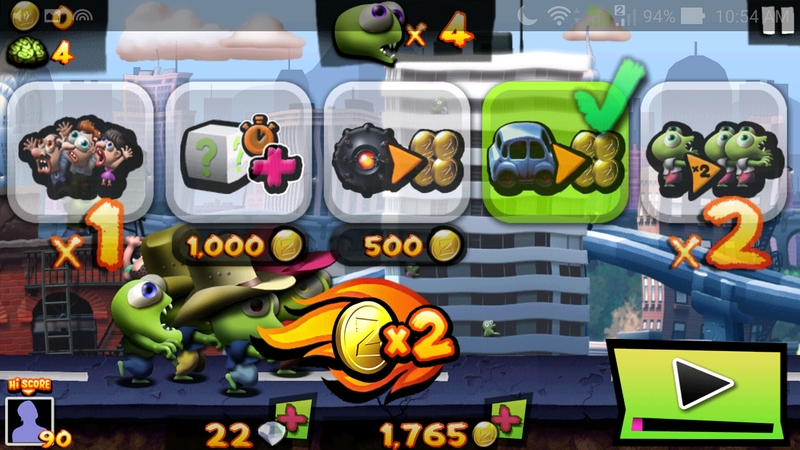 You can earn plenty of gold coins by playing the game lots of times, completing missions successfully, and obtaining enough brains to access lotto tickets. With gold coins, you can upgrade your skills to make the power-ups stronger and last longer. Personally, I prefer to earn gold coins with my own efforts. It just feels more challenging and rewarding when I accomplish missions and buy stuff in the marketplace using the coins I’ve earned. 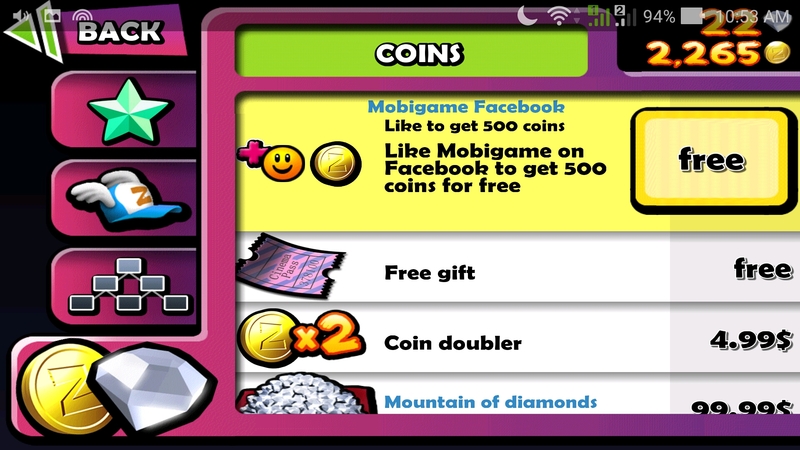 However, you can always choose to make in-app purchases to gain bags of coins or diamonds without breaking a sweat. Coin doubler is available, so you can earn twice the coins than typical. Red pills, blue pills, coin packs, diamonds, gold bars, and starter packs are other in-app purchases that can make your gaming experience much easier. On the whole, Zombie Tsunami is a thoroughly enjoyable and exciting game that can help you while away time whenever you’re bored. The availability of numerous missions, power-ups, skill levels, and items such as hats and backgrounds makes this game fun to play over and over again.